This searing image was widely circulated by Northern abolitionists to demonstrate the brutality of slavery. 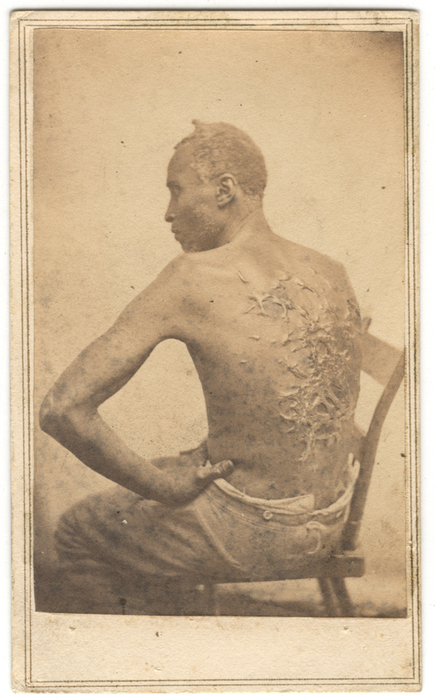 It represents the severe scars left by whipping on the back of Gordon, a former slave who escaped in Mississippi and joined the Union Army in Baton Rouge, Louisiana. A woodcut derived from this image, titled "Gordon under Medical Inspection," and two others that depict "Gordon as he entered our lines" and "Gordon in his uniform as a U.S. Soldier," were reproduced in the July 4, 1863, edition of Harper's Weekly along with an account of Gordon's escape. There the photograph is ascribed to McPherson & Oliver in Baton Rouge. But McAllister & Brother of Philadelphia, Chandler Seaver, Jr., of Boston, and an unknown British publisher also distributed pirated versions of the image. This example has no backmark.